AMSOIL, the #1 Leader in Synthetic Lubrication has a NEW Oil for Victory and Indian Motorcycle Users. When Bike owners spend thousands of dollars for their machines they want the BEST Lubricants money can buy and AMSOIL is the Leader in ALL Motorcycle Oils. 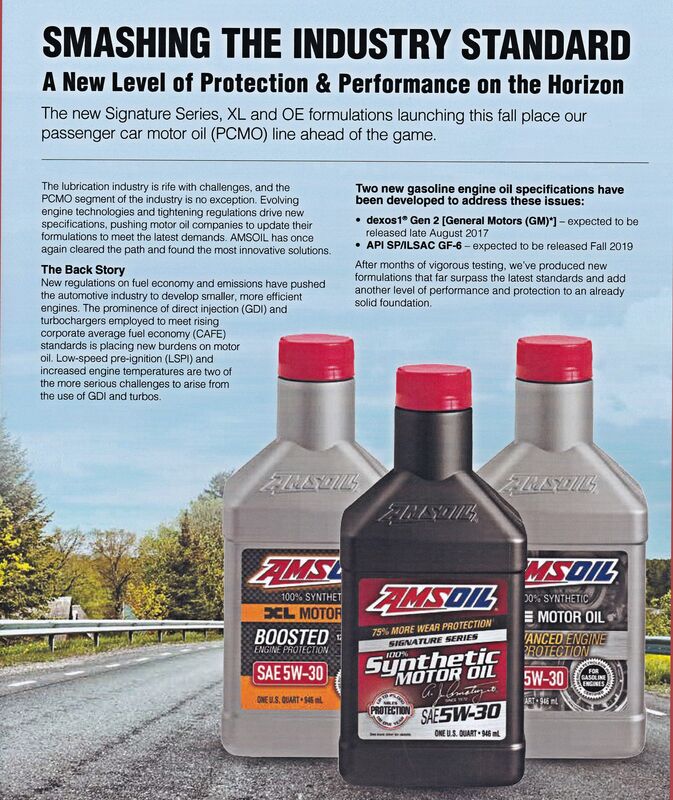 For more information about these oils and other AMSOIL Products plus how u may purchase go to http://www.amsoil.com or http://www.The1stSyntheticoil.com. You can call AMSOIL at 1-800-777-7094 and tell the operator you are working with ZO 9792. The Truth About Synthetics: Way More Than Just Extra HP! Synthetic oil is nothing new, nor is the controversy about whether synthetic oil is better than mineral oil. The development of synthetic oils, derived from silicones and polyolefins, occurred in the United States in the early 1930s. Germany evolved the synthetic oil technology during WWII due to their lack of natural resources and a need for oil. The Germans developed synthetic hydrocarbons, polyglycols, and alklylbenzenes to support their war machine. The US furthered synthetic oil development in the 1950s and 1960s with research into fluorinated lubricants. In 1972, AMSOIL developed and marketed the first synthetic motor oil to meet the American Petroleum Institute (API) service requirements. Oil is sorted in one of the five API base oil groups. Groups I, II, and III base oils are mineral oils that have been distilled and refined from a barrel of crude. Even after the refining, the hydrocarbon’s molecular structural arrangement and sizing remain inconsistent, and the base oils contain organic compounds most notably, oxygen, sulfur, nitrogen, and certain metals. The varying shapes and sizes of molecules result in irregular lubrication surfaces, and these irregularities generate friction within the base oil, increasing engine power consumption and reducing performance. The remaining compounds in the base oil can lead to oxidation, acid development, and the creation of sludge, especially in high-temperature usages. Mineral oils have a viscosity index (VI) ranging from 80-120 depending upon its base oil group. The VI is an indicator of an oil’s tendency to reduce flow with a rising temperature; higher numbers, associated with smaller changes in viscosity with temperatures, are desirable. Groups IV and V base oils are synthetic oils developed via a process known as synthesizing. These synthetic oils have uniform-sized hydrocarbon molecules, and the base oils are free from contaminates and impurities resulting in a base oil that is consistent and durable. Synthetics have a VI in excess of 150. 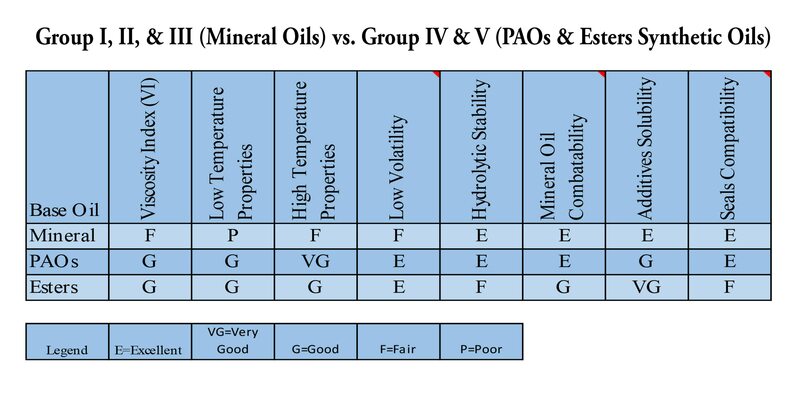 Group IV base oils are Poly-Alpha-Olefins (PAOs), and they have a wider temperature range compared to mineral based oils. PAOs work great in extreme cold conditions and high-heat usages. Group V base oils are classified as all other oils (esters), which includes silicone, polyaklylene glycol (PAG), polyol esters, etc. A common use of Group V base oils is to add the esters to another base oil. The addition of the esters improves the properties of the existing PAO base oil. PAOs formulated with esters tend to be the most popular for automotive applications. PAOs have an extremely high VI, high thermal oxidative stability (resistance to oxidation), low volatility (less oil loss at high temperature), excellent low-temperature viscosities, consistent base oil stock, excellent pour points, and have excellent hydrolytic stability (resist water) when compared to mineral oil. PAOs have some disadvantages, which include a limited ability to dissolve oil additives (solvency), a small chance to shrink seals, and higher consumer costs. To offset the disadvantages, adding diesters to PAOs increases the oil’s solubility. Specific esters, called seal swell agents (SSAs) blended into the oil remove any chances of shrinking seals. SSAs are seal conditioners that clean the seal, and the PAOs lubricate the cleaned seal. Lastly, the higher costs of PAOs is offset by the extended service intervals of synthetic oils. To improve the VI of an oil, enhancers called VI Improvers are added. The VI Improvers are long-chain molecules that can be fragmented by mechanical shearing, which in time results in a lower oil viscosity. Shearing occurs in high-stress areas such as the oil pump, crankshaft area, camshaft area, piston rings, etc. The oil (hydrodynamic film) can be briefly squeezed from between the two metal surfaces splitting the long-chain molecules into shorter, lower weight molecules. The shorter molecules offer less resistance to flow. Shearing can also contribute to deposits, causing sticking rings, increased consumption of oil, and increased engine wear. Synthetic oils often have the best VI Improvers and use less VI Improvers than mineral oils. Less VI Improvers help the oil maintain the higher-grade number (5W-20) for a longer interval. These VI Improvers maintain an oil film strength 5 to 10 times greater than mineral oils. As mentioned earlier, one main advantage of synthetics is its robust boundary layer, which allows it to cling heartily to engine components when the engine is off. With vintage and high-performance automobiles, this can often be for lengthy periods of time. This protective boundary layer reduces the metal-to-metal contact during the critical seconds after engine startup. The excellent oiliness (a lower coefficient of friction of one oil compared to another fluid of the same viscosity) of synthetic oils reduces engine wear during the initial, critical engine startup. Mineral oils lack such a robust boundary layer, as the oil drains quickly to the oil pan when the engine is off. Nevertheless, the synthetic oil boundary layer affords an enthusiast the necessary piece of mind when their vehicle is started after an extended dormancy. By some estimates, initial start-up and running in the first seconds accounts for as much as 90 percent of all engine wear. Let’s look at this in detail. The largest contributor to the superior shear load protection of synthetics is the uniformity of the molecules. In traditional mineral oils, the lube stock is refined from crude oil, such that all the molecules in the base stock have similar weights—they were sorted (i.e. “refined”) by virtue of their boiling point. Structurally, however, these molecules can be quite different in shape and in length. The degree to which molecules are chemically similar is more a function of luck, and the geology of where the base stock originated. By way of explanation, all base mineral oil stocks have a distillation curve that represents the average distribution of molecular weight, with the fat part of the curve—the oil’s rated weight—being at the center of a Gaussian distribution (bell curve). Chemically, the compounds in such a diverse base stock will have different properties and shear strengths. In use, the smaller molecules at the bottom of the distillation curve will have a higher volatility and evaporate quickly, causing the oil stock to thicken over time. Longer chain molecules at the top of the distillation curve are mechanically weak and will break under severe pressure, reducing the effectiveness of the boundary lubrication layer. Since synthetic molecules are practically identical in length, structure, and shape, the Gaussian distribution of their weight is tight, so there is no practical variation in the strength or chemical property of constituent molecules. As such, this optimized oil stock shall protect far better, and for far longer than mineral-based oil stocks. We contacted AMSOIL for a full array of synthetic oils for the engine, transmission, and rear end to test in our late-model Dodge. Our test vehicle would be a ’06 5.7L Charger that had been using a 5W-20 oil, Mopar ATF+4, and Mopar 75W-140 (all mineral based oils). 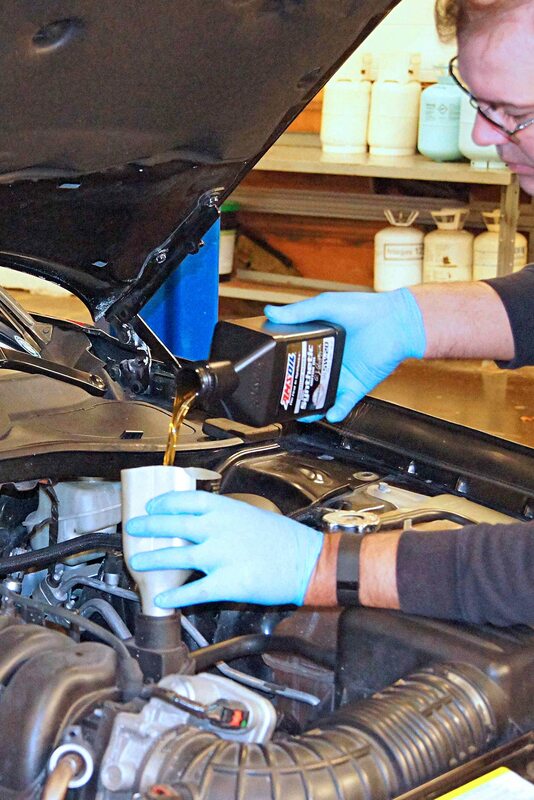 AMSOIL’s Signature Series 5W-20 motor oil and matching EA synthetic media oil filter provide up to a 25,000-mile, 700-hour, or one-year service interval. The ATF chosen was AMSOIL’s Signature Series Multi-Vehicle Synthetic, and the gear oil selected was AMSOIL’s Severe Gear 75W-140 and a 4-ounce tube of AMSOIL Slip Lock additive. With the AMSOIL products installed, the Charger burned five tanks of fuel to establish an estimate of fuel mileage. 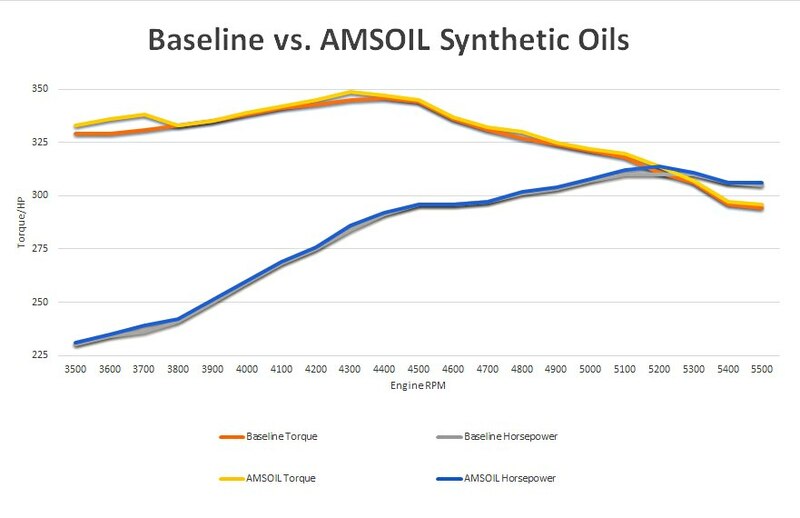 Our fuel mileage with the AMSOIL product increased by 0.9 mpg. The Charger was strapped to the Pennsylvania College of Technology’s Mustang dyno, and the performance numbers were up as well. Peak torque was up 2.6 lb-ft and peak horsepower was up 4.4 hp. 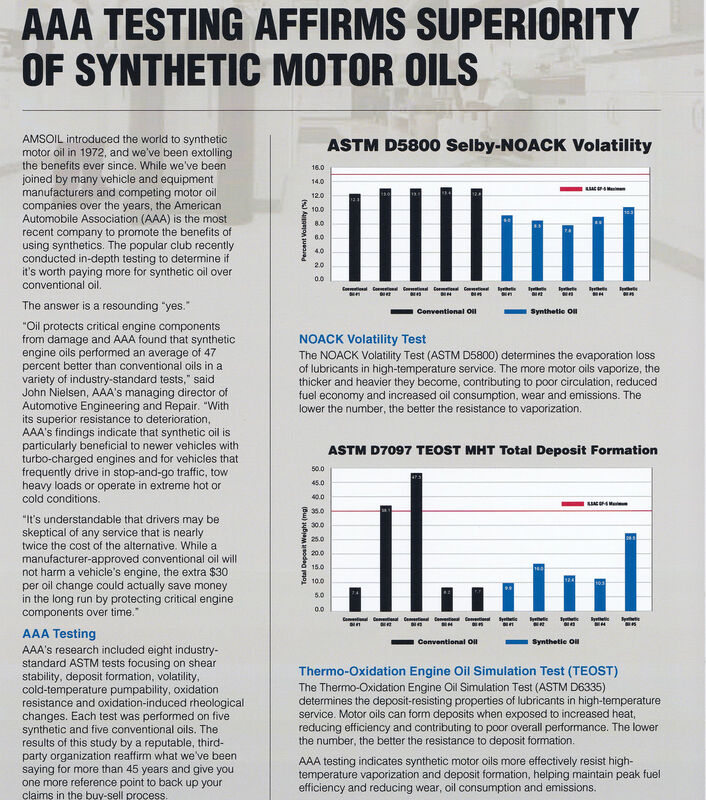 While we could not test component wear, AMSOIL and independent studies have shown the use of synthetics reduce wear and provide cleaner components leading to greater longevity of bearings, pistons, rings, clutches, bands, gears, etc. 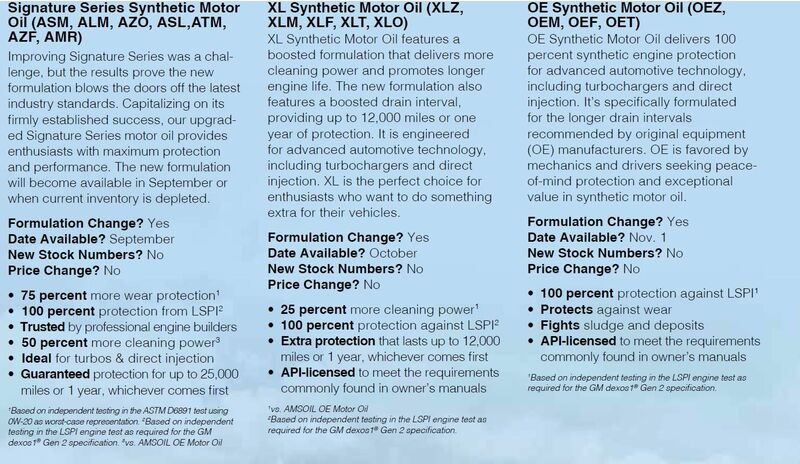 So why not try synthetic oils in your Mopar? The initial cost is offset by extended service intervals and increased longevity of the engine components due to the uniform molecule structure, low-temperature pour points, superior stability of viscosity, better shear properties, and superior boundary layer protection. Protracted service intervals mean less disposal of waste oil, benefitting the environment. Finally, putting synthetics in your Mopar will benefit your wallet with better fuel economy, and you will have a few extra ponies under your right foot as a byproduct. In spite of the immediate short-term benefit, the biggest advantage is in synthetic’s ability to significantly prolong the life expectancy of critical wear components where metal-on-metal contact is greatest. If you plan on keeping your machine on the road for years well beyond the warranty period, a synthetic like AMSOIL will keep bearings, rings, bores, lifters, cam lobes, valve guides, bands, clutches, and pumps running like new well past normal rebuild intervals, and that means money in your pocket. Mineral oils (left) are refined crude oil lubricants that have varying molecular shapes and sizes resulting in irregular lubricant surfaces. These irregularities produce friction inside the oil, which increases power requirements and reduces efficiency. Synthetic oils (right) have molecular shapes and sizes that are identical, reducing the internal friction in the oil. The reduced friction benefits the engine on cold startup, increases fuel economy, and can improve engine torque and horsepower output. critical seconds after engine startup (right). Synthetic oils have a wider temperature range of operation than do mineral oils. The pour point of a Polyalphaolefin (PAO) oil is outstanding, and this allows the oil to move to engine parts much quicker than mineral oil at low temperatures. Synthetic oils do have some extreme cold and hot concerns, but the limitations are well beyond the temperatures where mineral oils have already failed. This chart provides information about how mineral oil and synthetic oils compare. In most cases, synthetic oils outperform mineral oils. 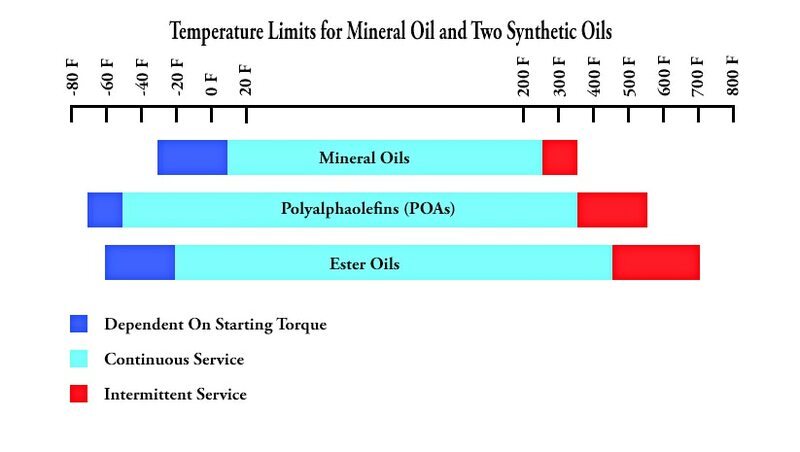 If the synthetic oils are not the best in a category, they are tied with the mineral oils, but the blending of certain Esters to PAOs extends the time between service intervals of the synthetic oil, thus outperforming all mineral oils. After all the lubricants were replaced with AMSOIL fluids, the 5.7L Charger was strapped to the Pennsylvania College of Technology’s Mustang chassis dyno. The peak rear wheel numbers were up. Torque was up 2.6 lb-ft, and the horsepower was up 4.4 hp. The fuel economy increased by almost one mpg, and best of all, the AMSOIL products will provide greater longevity for the bearings, pistons, gears, clutches, bands, and gears. The AMSOIL products are far superior to mineral oils in nearly every quantifiable category. 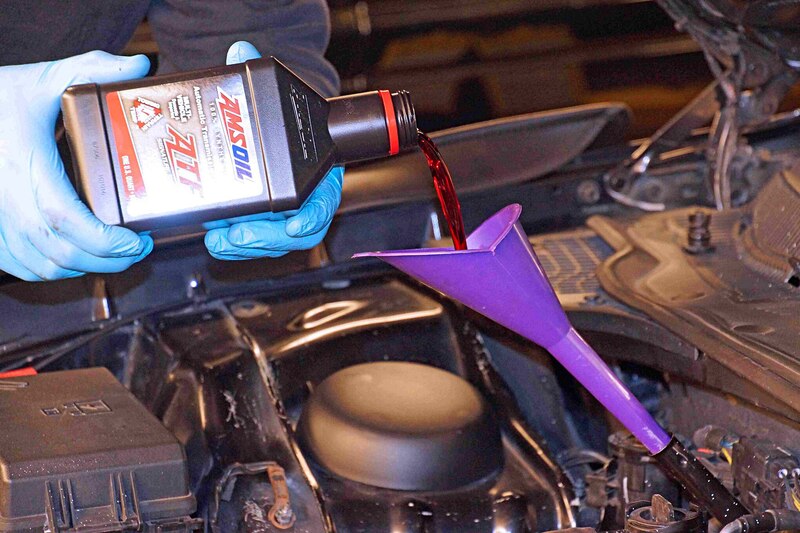 Seven quarts of AMSOIL’s Signature Series 5W-20 motor oil was poured into the Hemi. The AMSOIL extends the service intervals to 25,000 miles, 700 hours, or one calendar year. A matching AMSOIL EA synthetic media oil filter replaced the factory filter. Prior to filling the transmission, a new factory filter and pan gasket were installed. 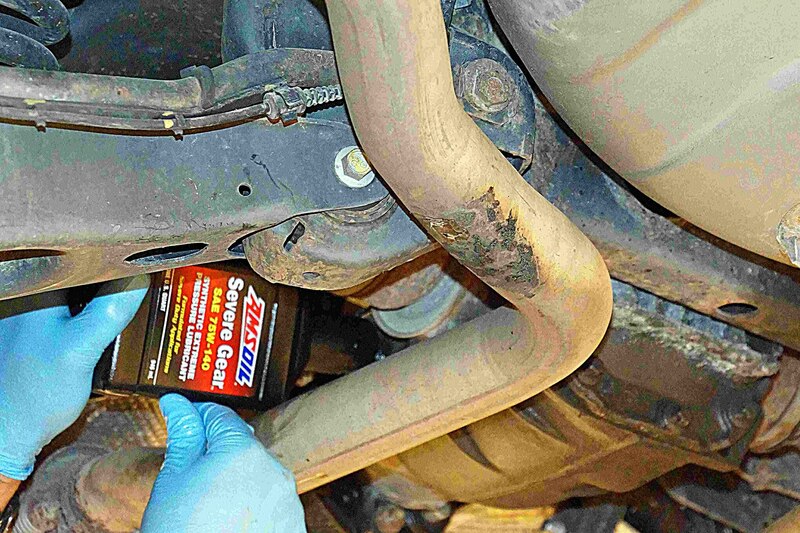 Five quarts of AMSOIL’s Signature Series ATF was tipped into the NAG1 transmission. The transmission was warmed up and a small amount of additional fluid was added. To accurately measure the required amount of fluid, a specialty tool and scan tool that provides the transmission temperature information are required. The gear oil selected was AMSOIL’s Severe Gear 75W-140 and a 4-ounce tube of AMSOIL Slip Lock additive. A 14mm hex socket is required to remove the fill plug (always remove the fill plug first) and then the drain plug. The filling of the differential housing required some finagling to get the quart container and fill hose next to the fill hole. If clearance is not available, the use of a pressurized filler container will push the oil into the housing. 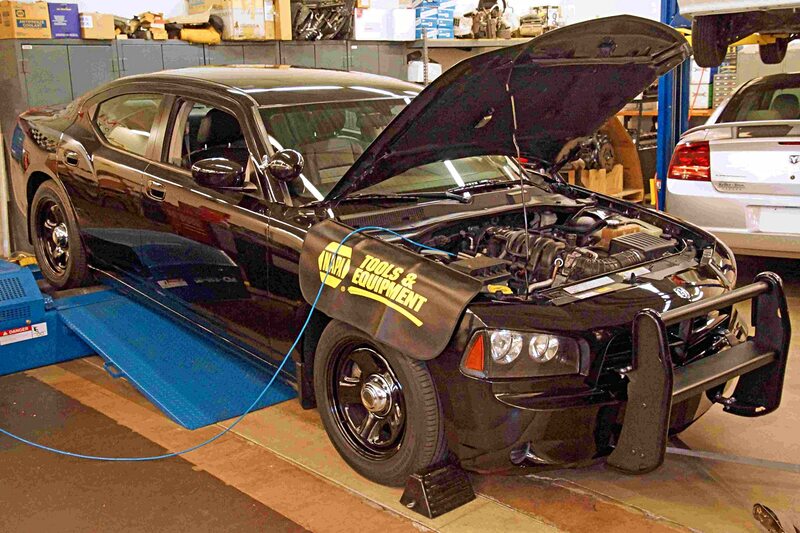 The 2006 Police Charger has a DiabloSport Diablo tune and Performance Distributors SOS coils with Autolite plugs. The engine has less than 35,000 miles on it, and the transmission has accumulated only 20,000 miles since it was replaced. The 2.82:1 rear gears are the 87,000-mile original gears. 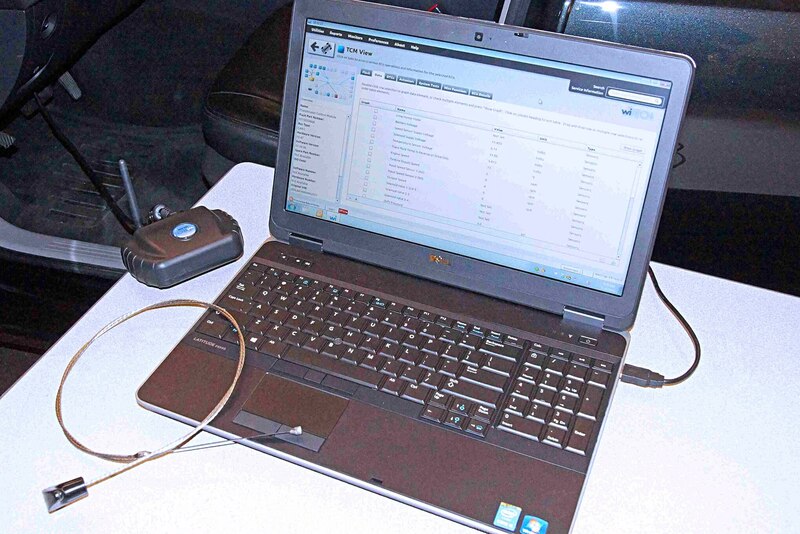 To properly fill the NAG1 transmission, a Chrysler WiTech scan tool (top left) was connected to the under-dash DLC and attached to a laptop. The WiTech software provides several different data lists of information. With a warmed-up transmission, the transmission fluid temperature must be observed while the transmission selector is in Drive or Reverse. With the temperature noted, Chrysler specialty part number 9336a—a factory dipstick with 10mm increment measurements—must be used to measure the oil level. Based upon the millimeter reading on the dipstick and the temperature of the fluid, the fluid level must be adjusted accordingly. A service manual (or online source) will provide the temperature/fluid level chart for proper filling. I hope you find this article interesting as it tells all about Oils and their classifications and Synthetics vs Petroleum. There is lots of skepticism about Synthetic Lubricants but they have been around since 1972 for use in America. For more information about AMSOIL Products go to http://www.amsoil.com or http://www.The1stSyntheticoil.com. Should you desire to purchase products you can call 1-800-777-7094 and tell the operator you have been talking with ZO 9792. In our ongoing process to improve product quality, we’ve adjusted the formulation of Outboard 100:1 Pre-Mix Synthetic 2-Stroke Oil, which has resulted in a change in color from green to blue. The oil continues to provide outstanding performance at 100:1 mix ratios in outboard motors. Pricing remains unchanged at $4.45 for an eight oz bottle.. The new formulation will become available over the next 30 days as current inventory is depleted. For further information about the #1 Two-Stroke Oil on the market go to http://www.amsoil.com or http://www.The1stSynteticoil.com. I have used the 100:1 mix ratio for over 20 years and have never had a break down or an engine seize in a weed eater, chain saw, pole chain saw, edger or anything else Two-Cycle. Regardless of that manufacturers tell people, you DO NOT need 32:1 or 50:1 mix ratio. Eight ounces of AMSOIL’s Saber Oil to Six Gallons of fuel equals a 100:1 ratio. Or 1.3 ounces to one gallon of fuel equals 100:1 ratio. With AMSOIL’s Saber Oil you will see NO Smoke, NO Plug fouling and NO Carbon Buildup on the piston or exhaust port. Call 1-800-777-7094 should you desire to purchase this product. Give the operator ZO 9792 as the person you have corresponded with.